Once you meet Timothy Green, you'll never be the same. Now that I've met Timothy Green, I believe it. I'm not the same. He's stuck with me. I've been thinking of Timothy all day. I love love loved the movie. Loved the story. Loved the characters. Loved the casting. Loved the music. LOVED. If someone asked me to see it again, I would. And, I will totally buy the DVD. BUT.... I won't be taking Zoe and Ana (7 & 4) to see the movie. From the trailers, they want to see it. It looks all good (and it is). But, in my opinion (MY OPINION) it isn't a children's movie. It might be OK for your children, or your children, or your children. But, I don't think it's OK for my children... and it might not be alright for your children. I'm really glad I saw it before taking my kids. My sister-in-law, Andrea also went with me to the screening. My nieces and nephew, Larisa, Alex and Nina (10 & 8 & 5) also want to see the movie. She still plans on taking Larisa and Alex, but not Nina. And even though she's still planning on taking them... she's really happy she saw it first so she's prepared for the possible reactions. Ok... Now comes the part where I'm not quite sure how to give a little more of my opinion without giving away the movie end. You can leave my review now... the next part might be a spoiler for you. But it might not. Up to you. So, I loved this movie. Thoroughly LOVED this movie. The story was real while being unreal. Magically unreal. While it dealt with heavy topics (infertility, adoption, bullying, being different, family love, adult "sibling rivalry", death...) it had moments of complete laugh out loud humor. It was clever. It was touching. 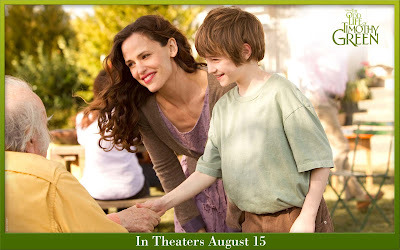 It was an absolutely relatable story of parents trying to do the best they can while being perfectly imperfect. Part of my love was in the casting. 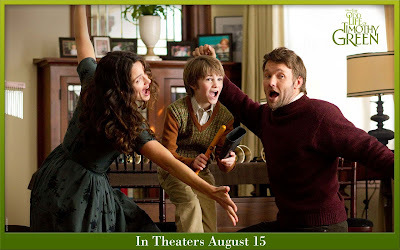 Cindy and Jim Green (Jennifer Garner and Joel Edgerton) were the perfect parents. I want them to be my parents. Heck... if I wasn't here I would totally want them to be Zoe and Ana's parents. And then there's Timothy (CJ Adams). I don't know how anyone could not simply fall in love with Timothy. Garner, Edgerton, and Adams simply made the film come to life. Perfect casting. 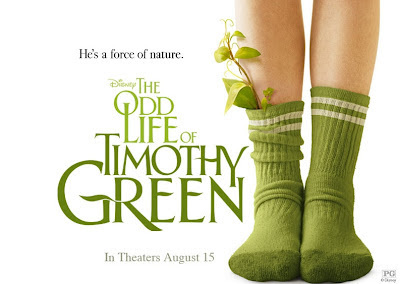 The Odd Life of Timothy Green was not totally what I expected. The trailers (all of them I saw and have since looked at) don't quite hint at what totally happens in this movie. It WAS heartwarming. It WAS about accepting differences. It WAS about family. It WAS uplifting. It WAS funny (oh, my, gosh... laugh out loud funny). BUT... at the end... I bawled my eyes out. I "try not to sob out loud" cried in the screening room. And I had no tissues. The trailers didn't prepare me for that. And it wasn't a happy, heartwarmed, uplifted cry. Now, this crying that I experienced is not saying that I didn't love the movie. Like I said... LOVED it. But, I'm glad I saw it by myself with a bunch of grown women. Zoe wants to see this movie, and I was planning on taking her (and Ana). Now I'm not going to take them. I think it would be too much. I think it would upset them. I think it might even go so far as to scare them. Disclosure: I was invited to see The Odd Life of Timothy Green by The MOMS and presented by Lipton. We were treated to pre-show light reception and gift bag. The opinions expressed in this post are my own.